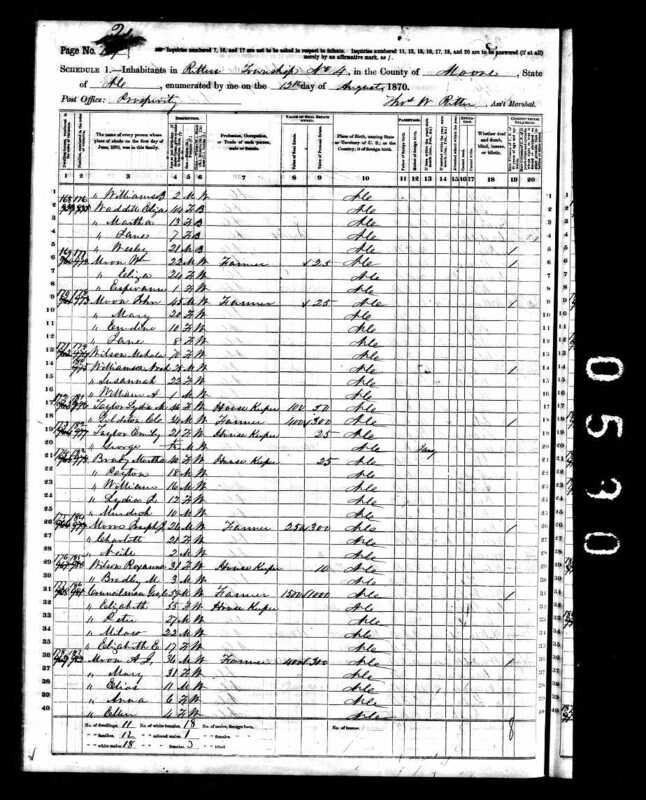 Milo Councilman, son of George Councilman and Elizabeth Allen, born 1m-7-1847. Tombstone shows birthdate 7 Jan 1847. Listed in Chatham Co Death Index, book 2, p66. 6) Milo Councilman, age 2, born NC. 6) Norma Allen, age 18, male, domestic, born NC. 5) Councilman, Elizabeth E., age 17, born NC. 7. Story, 1875. Historical Sketch of Prosperity Friends Meeting says it was founded around 1875. Founders included Milo Councilman and Peter Councilman. A new building was built in 1905 with the persistent efforts of Milo, among others. It is the oldest meeting in Moore County. 9. Appearance in Document: Quaker Meeting Membership, 1 Jun 1878, Cane Creek Mtg, Alamance County, North Carolina, United States. 419,3856 Milo Councilman and wife, Martha J., received by request. 12. Appearance in Document: Overseer of Prosperty Meeting, 1 Jul 1882, Prosperity Friends, High Falls, Moore County, North Carolina, United States. 416 "Cane Creek Mo Mtg 1st Mo 7th 1882. ... The com appointed in 10th Mo to visit friends living in Moore County produced the following report, which this mtg accepts & appoints the persons therein named for Overseers for this year (Viz) We the com appointed in 10th mo last to visit friends at Prosperity in Moore County relative to their request report that four of us attended & held meeting with them for three days on the 26, 27, & 28th and we are united in the belief that they should have a meeting for worship established at that place by the name of Prosperity to be held on 1st and 4th days of each week, and further that they may have th eprivilege of holding a Preparative meeting on 4th day before the 1st 7th day of each month and we propose Milo Councilman & Betsey Finison for Overseers in that meeting." 16. 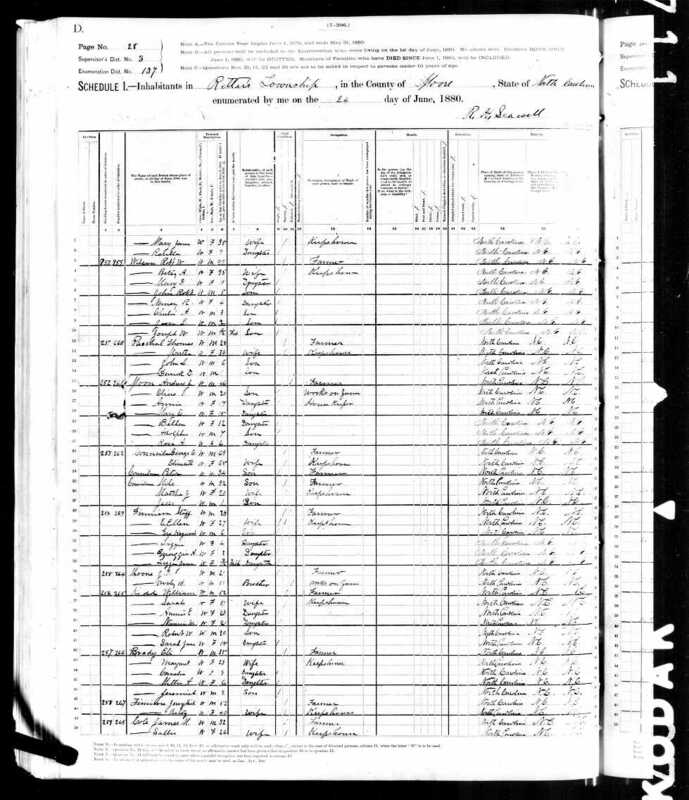 Appearance in Document, 25 Aug 1887, Moore County, North Carolina, United States. Geo C Councilman will in Moore Co Will Book D, p278, mentions son Peter Councilman and son Milow Councilman, co-executors, who share "land where I live on Deep River, 130 acres, that I purchased from Cornelius Shields". 18. Appearance in Document: Transfer Quaker membership to Holly Spring, 6 Apr 1889, Prosperity Prep Mtg, Moore County, North Carolina, United States. 418,419 Milo Councilman and wife, Martha J., and minors, John, Ella and George, members of Prosperity Preperatory Mtg, transferred with that mtg to Holly Spring Mtg. 24. 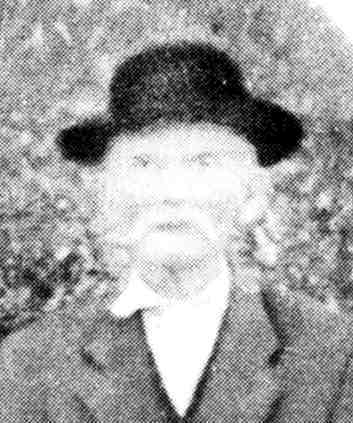 Appearance in Document: Elder at Holly Spring Meeting, 25 Mar 1904, Back Creek Mtg, Randolph County, North Carolina, United States. 3857 Southern Quarterly Meeting on Ministry & Oversight held at Back Creek the 25th of 3rd mo 1904. ... The Quarterly meeting reconsiders the portion of last Quarterly meetings minute as regards the appointment of Elders for Holly Spring Mo. Meeting & now brings up the matter in regular form which was considered & accepted & the Clerk was directed to inform the Mo. Meeting of such endorsement which are the following Huldah Craven, Leah Mason, Joseph J. Cox, Roxanna M. Cox, Milo Councilman, David Kemp & Anice Kemp. 8) Councilman, Ethel, daughter, age 3, born NC, parents born NC. 30. Appearance in Document: Alternate to NC Yearly Meeting of Quakers, 27 May 1911, Holly Spring Mtg, Randolph County, North Carolina, United States. 3858 Southern Quarterly Meeting of Friends held at Holly Spring the 27th of 5th mo. 1911. ... Michael A. Farlow, Levi B. Lowe, Wm. C. Winslow, J. Newton Farlow, Elma C. Macon, Herbert W. Reynolds, Ellen H. Woody, Wm. E. Woody, Dealy E. Hinshaw are appointed representatives and Milo Councilman, Flora Macon, Louisa Lowe, Ollie Moffitt, and George Frazier alternates to our ensuing Yearly Meeting and are to return whatever may be given them by it in charge and report to next meeting. 37. 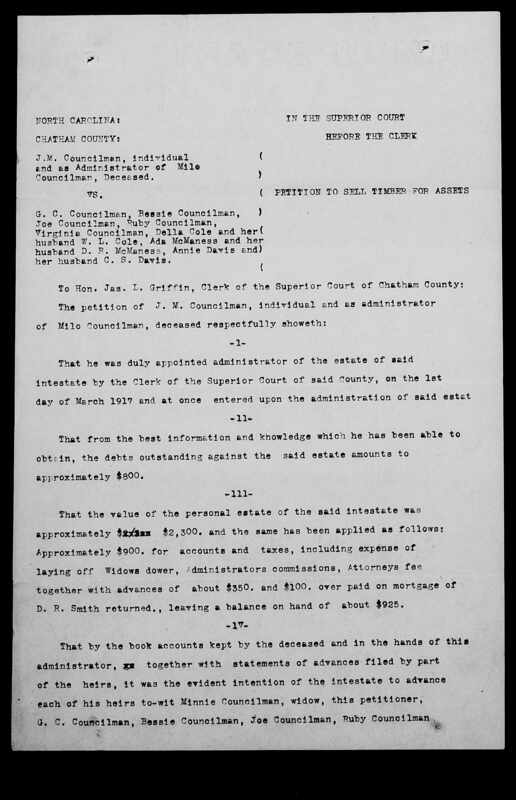 Probate: Sale of Timber, 17 Apr 1920, Chatham County, North Carolina, United States. 404 A Petition to Sell Timber for Assets was filed in Superior Court of Chatham County by J. M. Councilman, individual and as adminstrator of Milo Councilman, deceased, vs. G. C. Councilman, Bessie Councilman, Joe Councilman, Ruby Councilman, Virginia Councilman, Della Cole and her husband W. L. Cole, Ada McManess and her husband D. R. McManess, Annie Davis and her husband C. S. Davis. Petition says the heirs of Milo's estate are Minnie Councilman, widow, J. M. Councilman, G. C. Councilman, Bessie Councilman, Joe Councilman, Ruby Councilman, Virginia Councilman, Della Cole, Ada McManess (all of these living in Bear Creek NC) and Annie Davis (living in Eagle Springs, NC). Petition requests that timber from estate lands be sold to raise funds to allow the heirs to receive cash as requested by Milo. The land is in Chatham County Bear Creek Township, Lot #1 is 219.8 acres, Lot #2 is 72 acres. Petition was filed on 18 Feb 1920. Joe, Ruby, and Virginia are minors, so G. C. Councilman is appointed guardian to represent them. The sale of timber was ordered on 13 March 1920. On 17 April 1920 the timber was sold to C. S. Davis for $4800. 38. 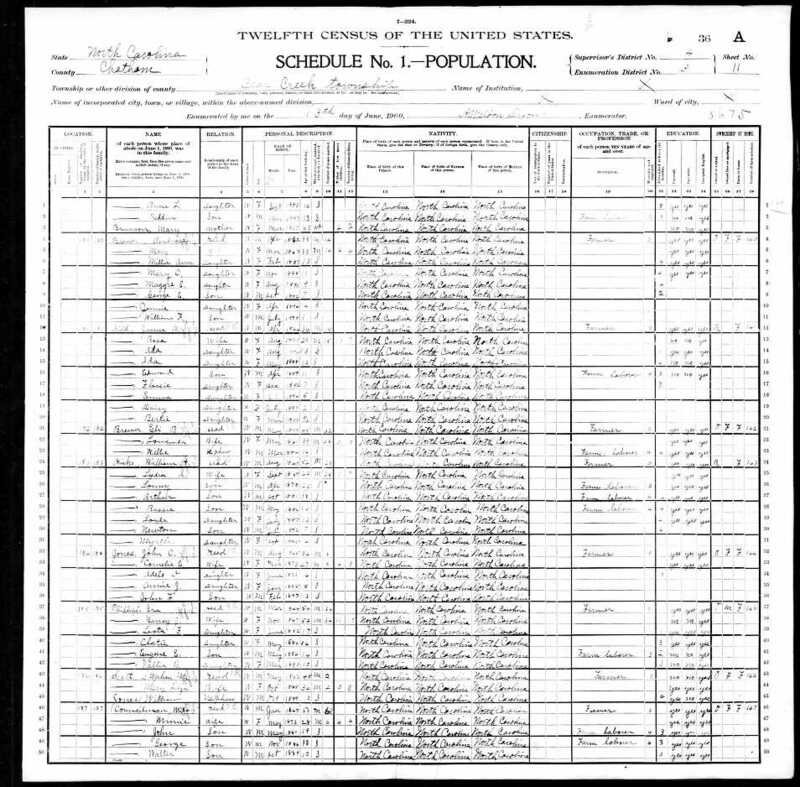 Probate: Divided lands into separate lots, 30 Oct 1920, Chatham County, North Carolina, United States. 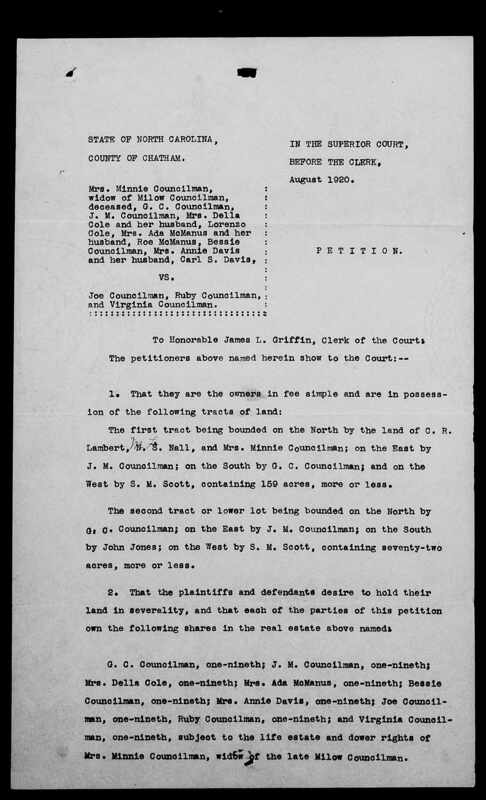 404 Petition filed on 24 Aug 1920 in Superior Court of Chatham County. Mrs. Minnie Councilman, widow of Milow Councilman, deceased, G. C. Councilman, J. M Councilman, Mrs. Della Cole and her husband, Lorenzo Cole, Mrs. Ada McManus and her husband, Roe McManus, Bessie Councilman, Mrs. Annie Davis and her husband Carl. S. Davis, vs. Joe Councilman, Ruby Councilman, and Virginia Councilman. Petition is to divide the land that is shared by all the hiers of Milo Councilman into separate lots. The land is identified as a 159 acre tract bounded on the North by C. R. Lambert, M. L. Nall, and Mrs. Minnie Councilman, on the East by J. M. Councilman, on the South by G. C. Councilman, and on the West by S. M. Scott, and a 72 acre tract bounded on the North by G. C. Councilman, on the East by J. M. Councilman, on the South by John Jones, and on the West by S. M. Scott. Victor R. Johnson is appointed as a guardian to represent the interests of Joe, Ruby, and Virginia Councilman, minors. The land was divided into approximately equal lots on Oct 30 1920. Lot 1 is assigned to Bessie M. McManus, Lot 2 to J. R. Councilman, Lot 3 to Della G. Cole, Lot 4 to Ethel R. Councilman, Lot 5 to Virginia R. Councilman, Lot 6 to G. C. Councilman, Lot 1A to J. M. Councilman, Lot 2B to Annie J. Davis, Lot 3C and Lot X to Ada B. McManus. The division of lands was confirmed by the court on 23 Nov 1920. 39. Occupation: Farmer. 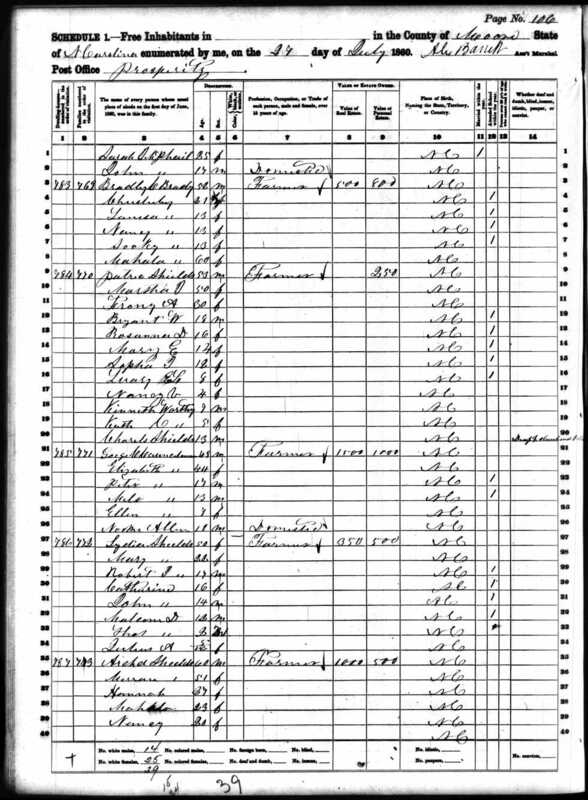 Listed as farmer in multiple census records. 40. Residence. 3860 "The Architectural Heritage of Chatham County" has a picture of his home near Harper's Crossroads, with an architectural description. The article, published in 1991, says he was a furniture maker, sawmiller, and farmer. It says Milo was born into the Cane Creek Friends Meeting in Snow Camp, and moved to southwest Chatham County. At the time of the article, the home was owned by Virginia Scott, the youngest of Milo's twelve children, who owned it since 1957. The house was probably built around 1880. 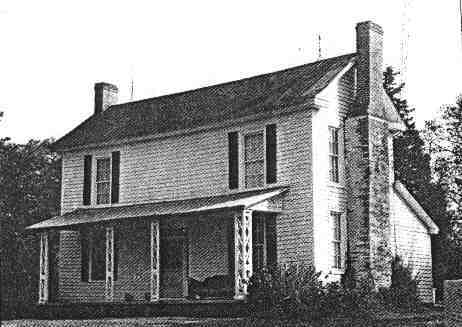 The article suggests that the chimneys on the house closely resemble those on the nearby Beal House and probably were made by the same local craftsman. 42. Story. 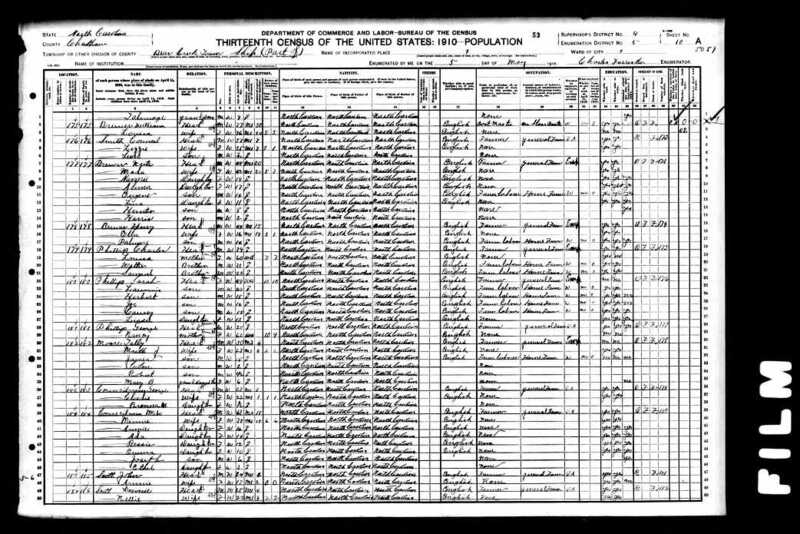 3328 There is a photograph of Milo Councilman and his brother Peter printed in "The Allen Family". 43. Story. I have several slides of a Councilman home, I believe it is Milo's home. 1. 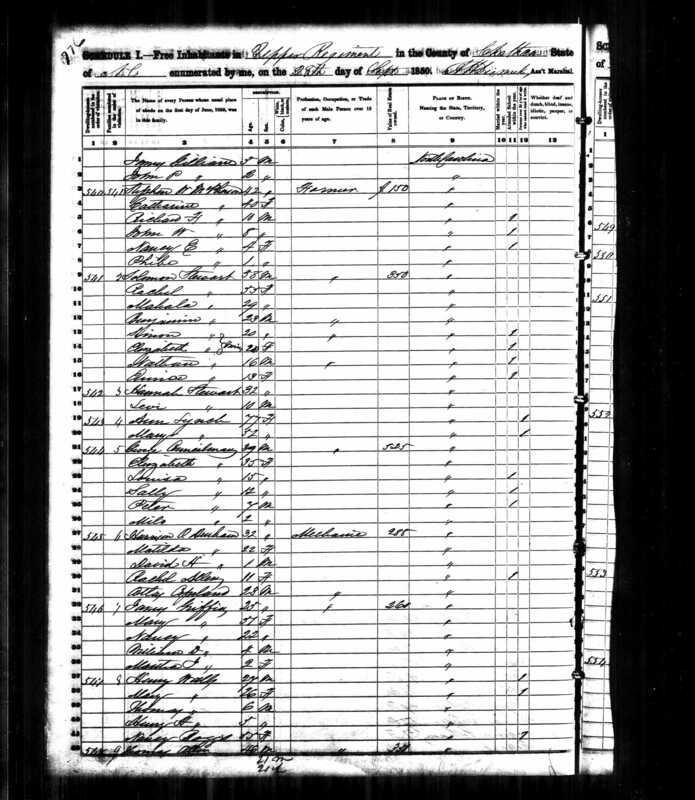 Marriage, 4 Oct 1892, Moore County, North Carolina, United States. 3852 Milo Councilman married Minnie Paschal. 3. Story. 401 Milo Councilman married second to Minnie Paschall.